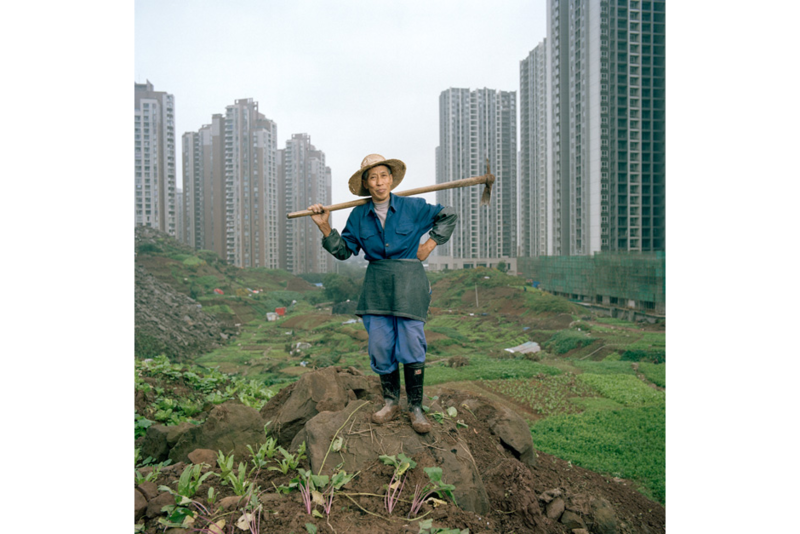 Wang Chengyun, a Chongqing resident, pauses for a photograph while helping his uncle clear an open plot on a construction site to use it for farming. In the Jiangbei district of Chongqing, just downstream of where the Jialing River joins the Yangtze, the city is pushing for more urban development. 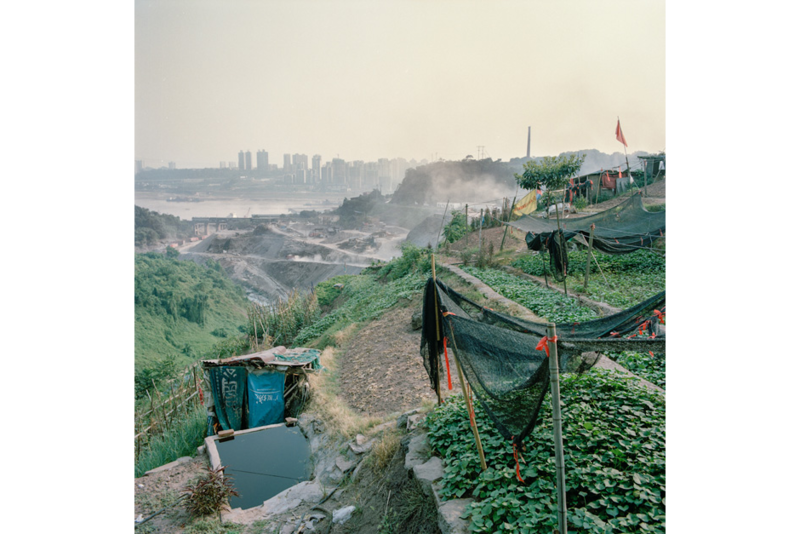 Farmers, relocated to the city due to the construction of the Three Gorges Dam hundreds of miles downriver, seek cultivable land on hillsides and active construction sites. 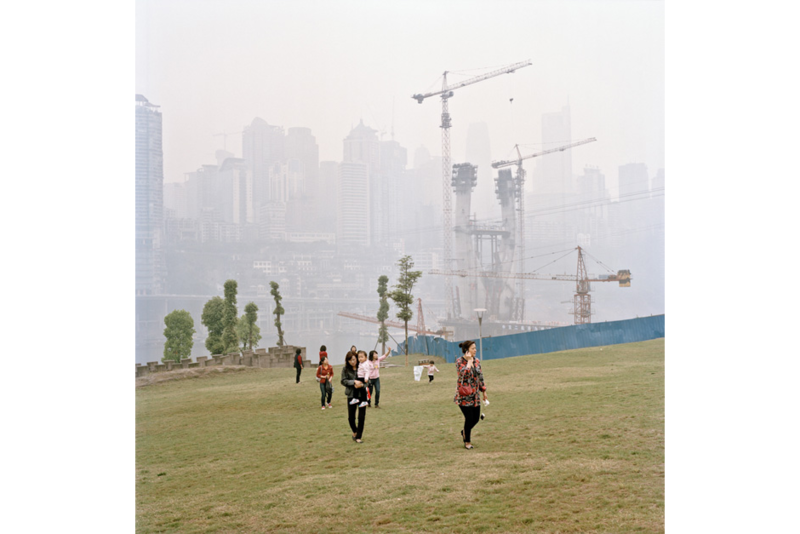 Construction cranes rise in the background mist as women walk with their children across the new grass of a development in Jiangbei. The city’s central business district is in the background. 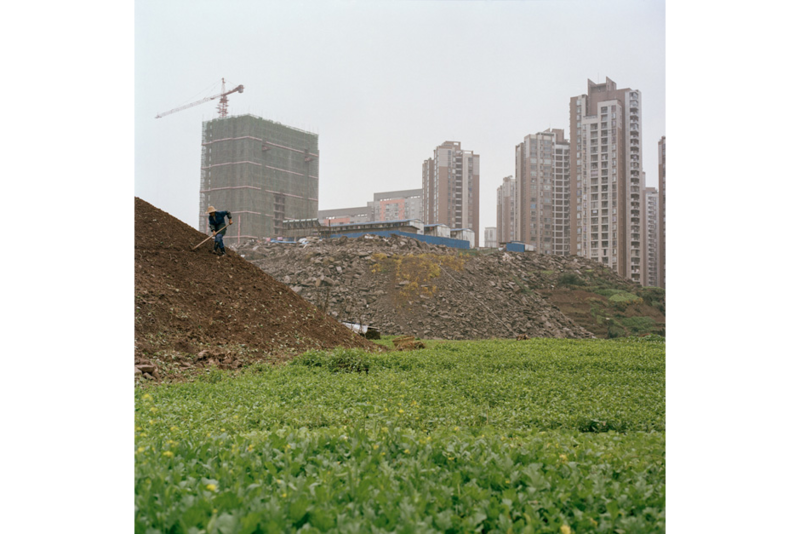 In the Jiangbei district, a woman cultivates a slope as giant cranes rise above a construction site for new housing and temporary structures used by the developers. With the influx of residents relocated from areas affected by the Three Gorges Dam, the Chongqing government began investing heavily in this part of the city, creating a new economic zone. Removed from the rising dust and noise of the construction site in the distance, an orderly plot of land with greens and vegetables wait to be watered and weeded. Fan Anshu moved to Chongqing from Fuling, a city of one million two hours east of Chongqing’s Central Business District. Her home and land were confiscated to make way for a highway. She receives RMB 700 (U.S.$111) a month in compensation. 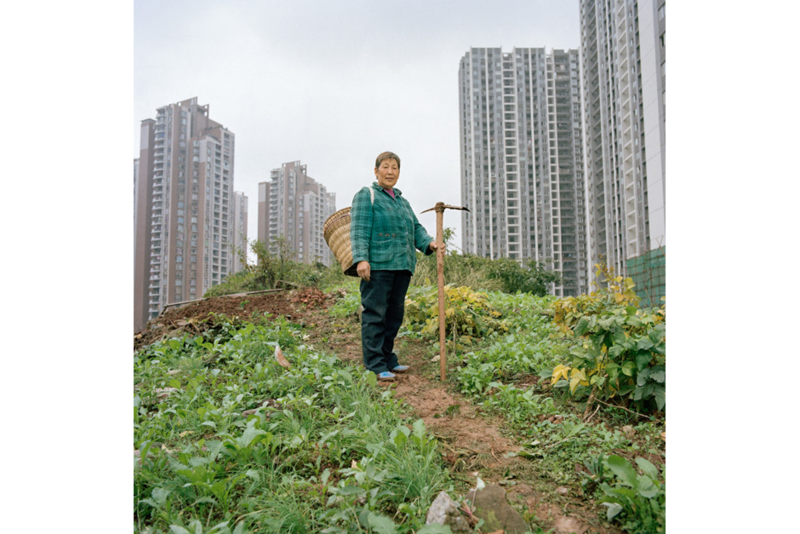 To help feed her family, she now grows vegetables on a muddy hillside next to a giant construction site in Jiangbei. A couple pastures goats in between a housing complex and a construction site in the Shapingba district. Tax benefits and other incentives offered by the local government have spurred areas of economic growth in the city’s central business district as what was once open space is converted to construction sites for new developments. 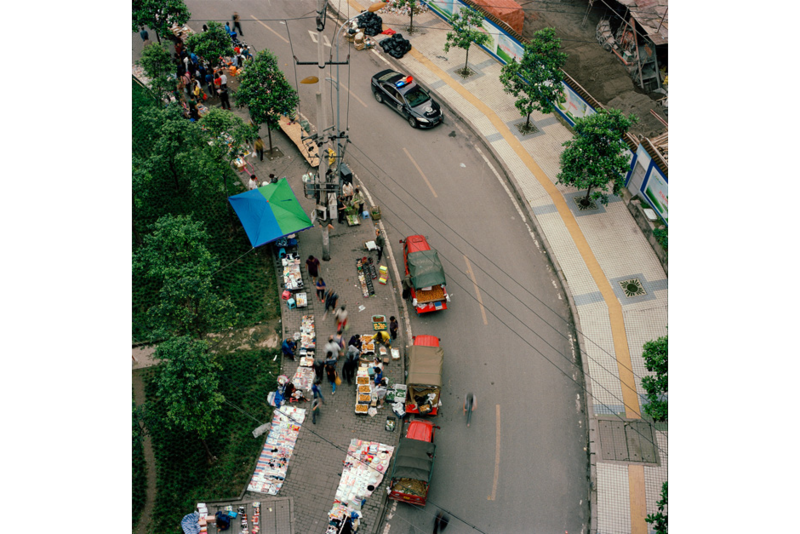 An improvised street market in the new development district of Jianbei allows urban farmers to come and sell their production. As Jiangbei rises into a forest of high-rises, shopping malls, and elevated roads, lifelong resident Ren Yindi, sixty-six, continues to farm. In 2007, Mr. Ren was given an urban residence permit and with it the right to enroll his children in the city school system. He exchanged his land for two apartments built in a new development. Ren hoes a man-made hillside, as temporary worker housing and permanent developments rising in the distance. He farms about 100 square meters of land and makes RMB 3,000 to 5,000 (U.S.$480-$800) per month selling his vegetables at local markets. 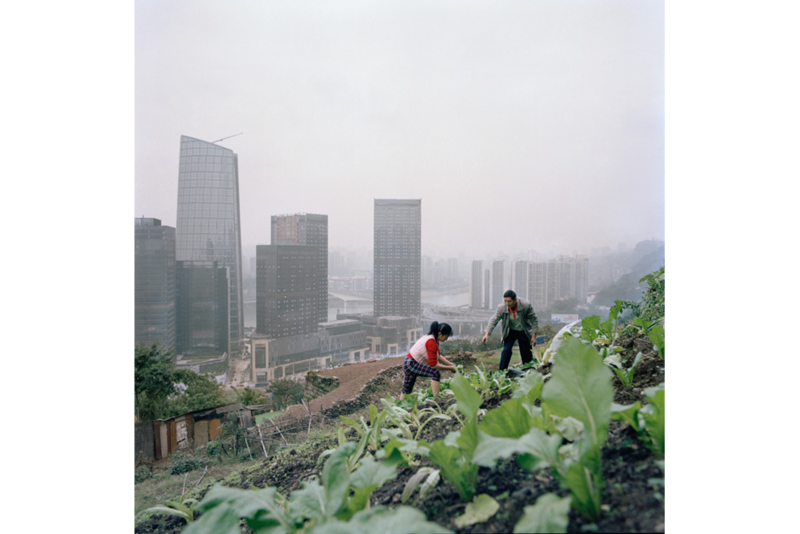 Huang Chunying and her husband work barefoot on a garden above the new business developments in the Tiandi district. Across the river from Jiangbei, a Hong Kong property developer is putting the finishing touches on a sleek modern development. There, residents and visitors who make up the emerging upper-middle class will be offered every modern-day convenience. Gan Guoying, fifty-seven, a former rural hukou resident from Chongqing, received her urban hukou (residence permit) in 2006 when she renounced her 500-square-meters of land. She continues to farm here, by the side of a highway bridge, to provide for her family and to sell in the market, earning her between RMB 1,000 and 2,000 (U.S.$160-$320) for her labor. Gan says she feels the city is growing too fast for the people to adapt. 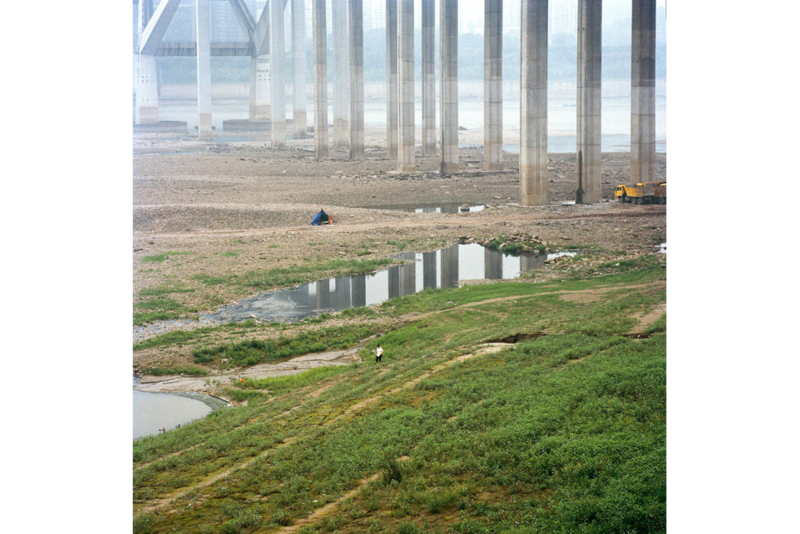 A man walks along the seasonally dry riverbed of the Yangtze, underneath bridge supports that carry traffic high above in Chongqing’s downtown. Farmers share these spaces with fisherman, construction vehicles, and recreation seekers. 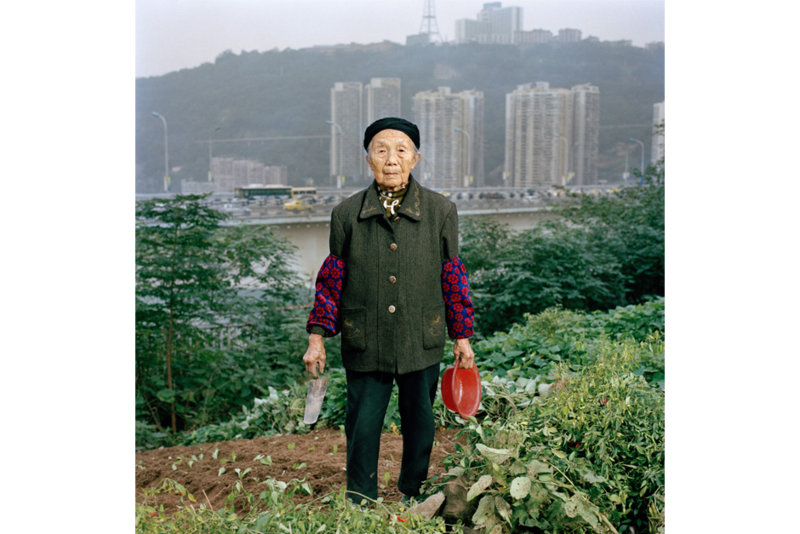 Zhong Baixin, eighty-seven, is cultivating a square meter of lettuce for her own table. 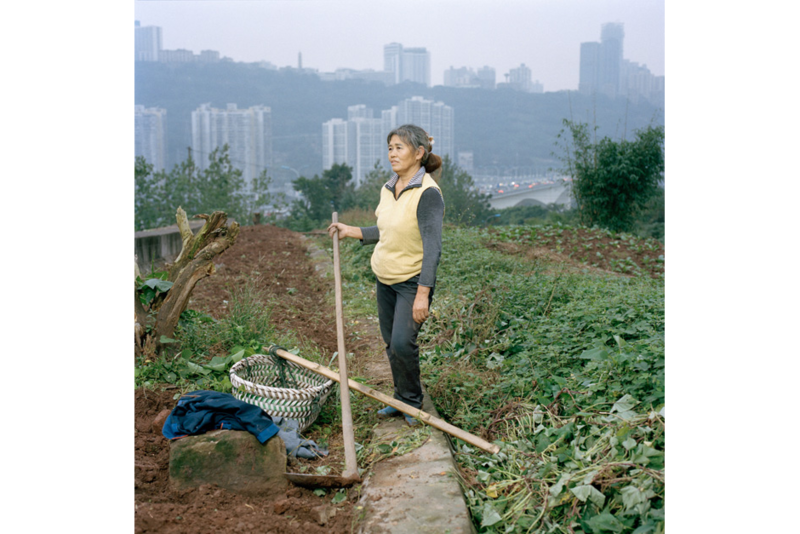 She has lived all her life in Chongqing and now lives in what remains of a farming village stuck between a construction site and a road. 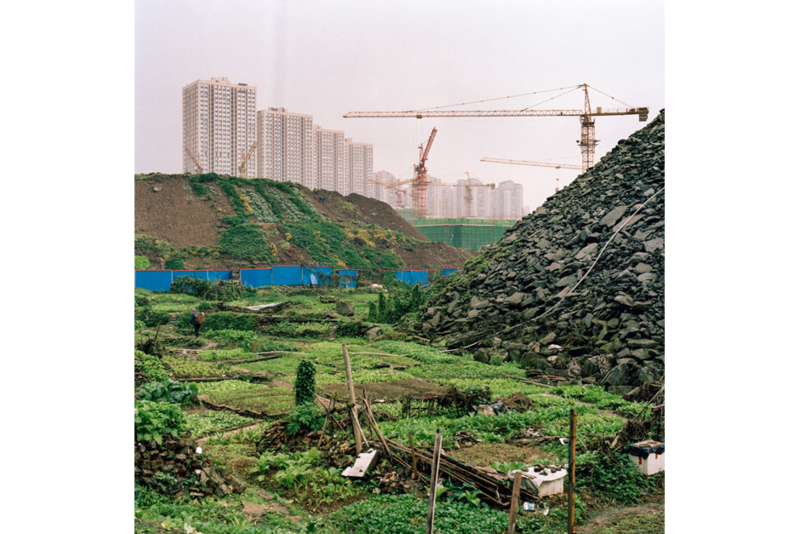 Improvised temporary farmland fills the gaps between construction rubble in a new Jiangbei development. 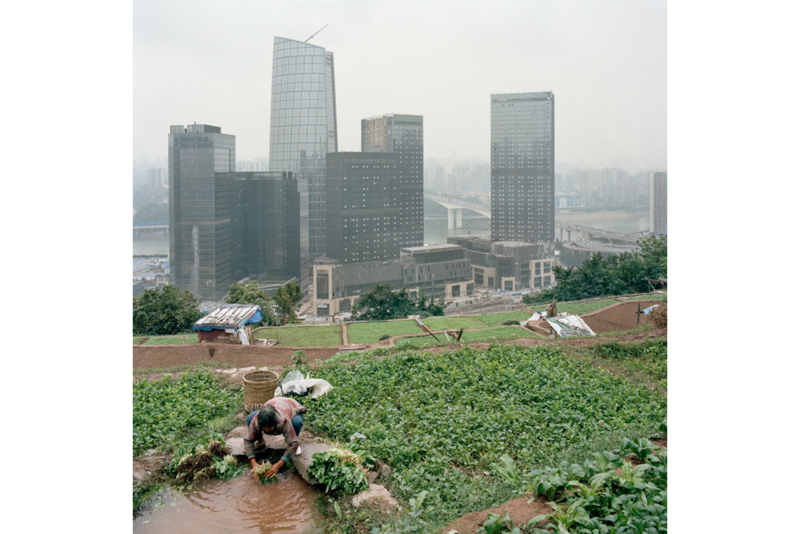 A farmer cleans vegetables she has harvested on a hillside above the Tiandi business district before going to sell them at a local market. 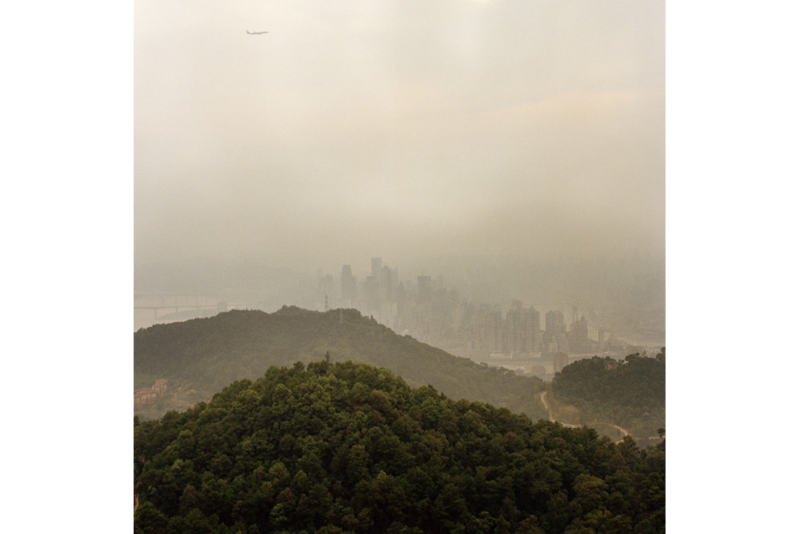 From a vantage point on top of Nanshan, the green hillsides and the cityscape appear to exist symbiotically. 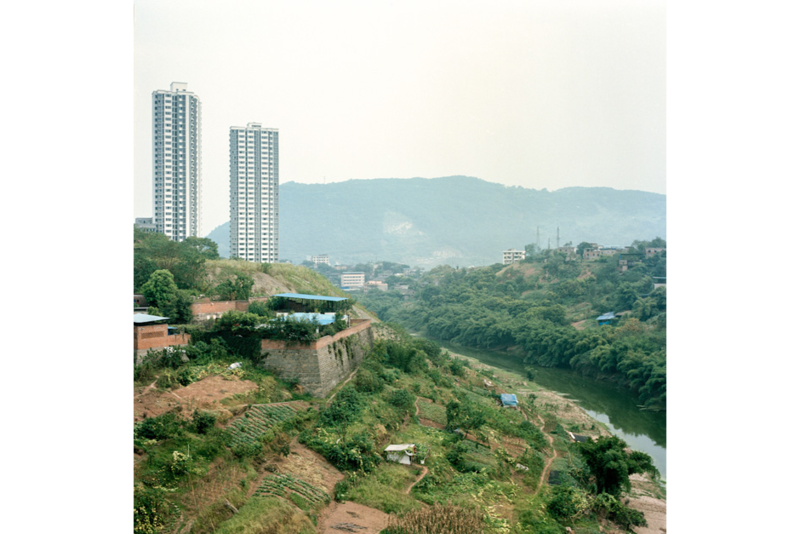 In fact, the terrain in the urban part of Chongqing keeps development concentrated to a relatively small area. 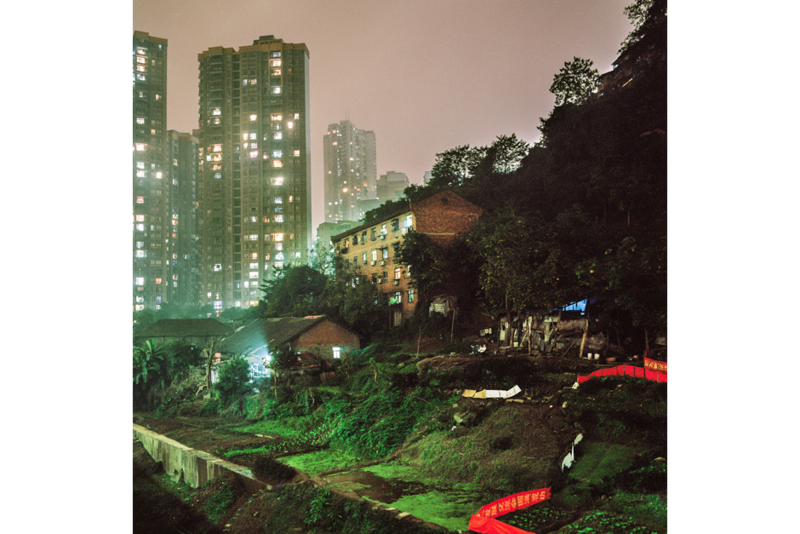 In the Shapingba district, a house and surrounding gardens are lit by urban light pollution as skyscrapers loom large from a nearby housing development project that are gaining most of the lands in this part of town. 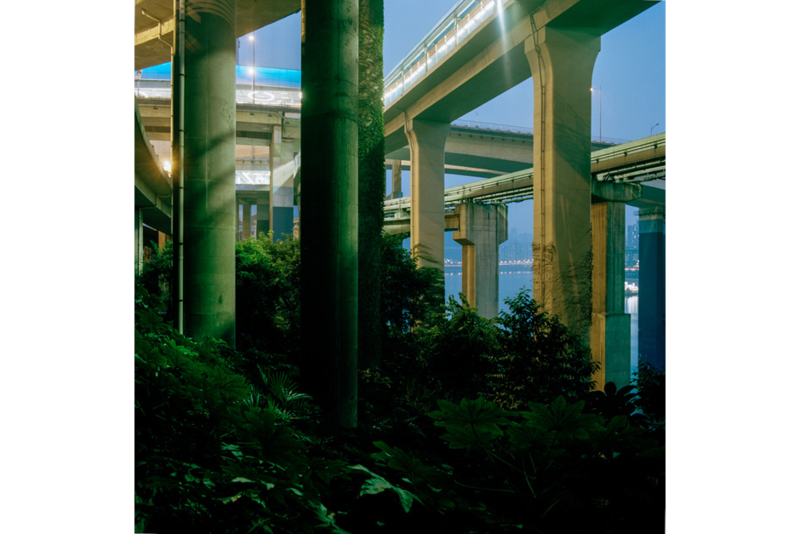 On the side of the Jialing river, under the Yu’ao bridge, the vegetation reaches upward in an apparent attempt to climb from the backfill and overtake the highway structure from below. Watch Franco’s presentation at Asia Society, held July 1, 2015. It’s a feature of the landscape one sees throughout China. 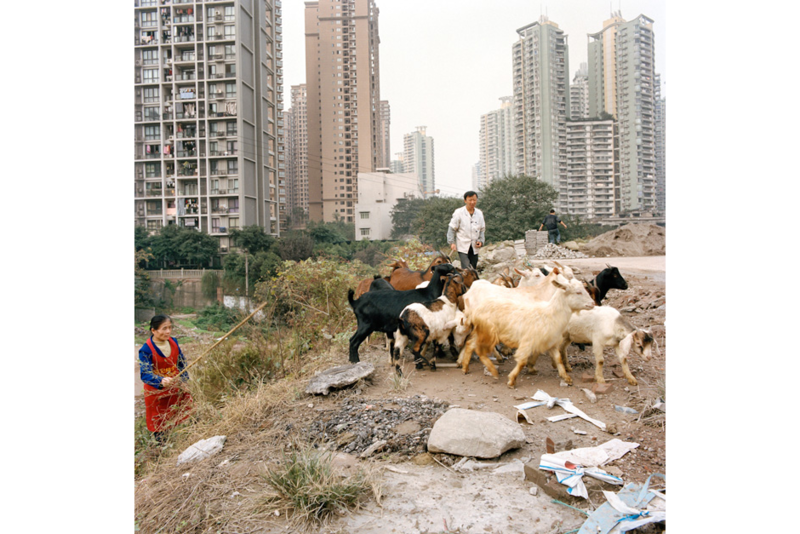 On the sides of roads, at the edges of construction sites, on the steep banks of rivers, and in pastures that wrap around the fat pylons of future highways, Chinese people are farming, tilling tiny jewel-like plots that may only last a season, or rushing a herd of goats or a flock of ducks through traffic. As its leaders often remind the world, China has twenty-two percent of the world’s population, but less than ten percent of its arable land (as much as one fifth of which, it was recently reported, is severely polluted). People find ways to make up for the shortfall. For centuries officials have complained of peasants cultivating marginal lands, and for just as long Chinese farmers have been geniuses of agricultural improvisation, making use of whatever land they could find when they needed it. Today, the country is in the midst of a massive shift from countryside to city. Much of it has occurred at will, as ambitious migrants have left the fields to seek new jobs and new experiences in the factories of China’s booming cities. But many others do not move at will. Instead, they are expelled from their homes and into strange new lives as city folk as the fields they once tended give way to new roads and shopping malls or slip under the rising waters of newly risen dams. Still others fall somewhere in between. They may find themselves following their children to new lives and new status as members of an urban population that, for the first time, in 2011 exceeded the number of those remaining in the countryside. 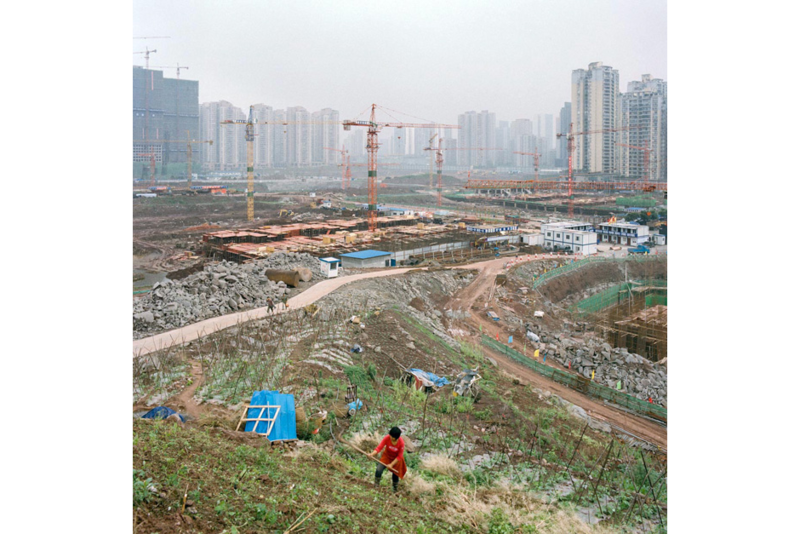 China’s leaders hope that seventy percent of the country will be urban by 2030. In cities, old rhythms of life die hard, and even as more and more farmland on the outskirts of urban areas disappears, new transplants and old holdouts continue to find patches of ground to plant. 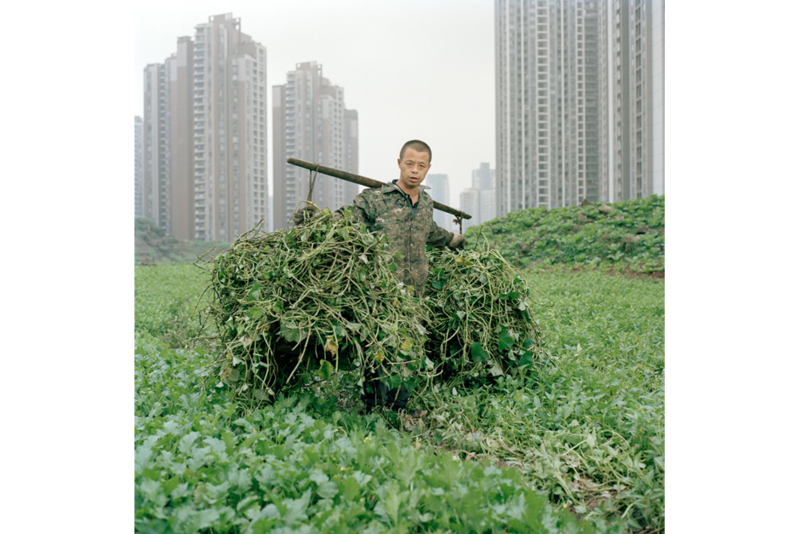 Tim Franco, a Shanghai-based photographer, has spent time on these “microfarms” in the heart of the megacity Chongqing, where the changes underway across the country appear especially stark. Some farmers grow food to feed their families, others to supplement their incomes, and some because, with the city closing in all around them, it’s the only thing that makes them feel at home.